According to "Whois Ap.gov.br", Ap is owned by Gerencia de Internet PRODAP of PRODAP-Centro de Gestao da Tecnologia e Informacao since 2016. Ap was registered with BR-NIC on October 21, 1998. Gerencia de Internet PRODAP resides in Brazil. Earlier, Ap owners included Gerencia de Internet PRODAP of PRODAP - C. de Gest?o da Tecnologia da Informa? ?o in 2016, Jose Lutiano Costa da Silva of PRODAP - C. de Gest?o da Tecnologia da Informa? ?o in 2015 and Jose Lutiano Costa da Silva of Governo do Estado do Amap? later that year and Jos? Al?pio Diniz de Moraes J?nior of Governo do Estado do Amap? in 2014. The current Ap.gov.br owner and other personalities/entities that used to own this domain in the past are listed below. If you would like to share more "whois" details on Ap with us, please contact us! Jose Lutiano Costa da Silva Governo do Estado do Amap? Jos? Al?pio Diniz de Moraes J?nior Governo do Estado do Amap? If you are Ap owner and would like to increase privacy protection level for your data - please, deal with BR-NIC which is your site’s registrar. 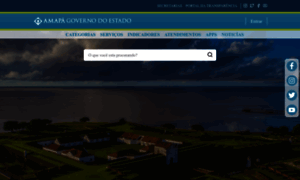 Whois history of Ap.gov.br is provided using publicly open domain data.